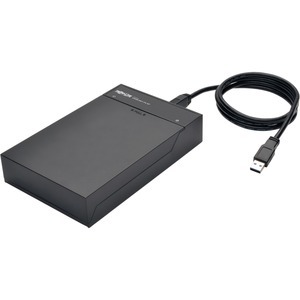 The U339-001-FLAT USB 3.0 to SATA Hard Drive Lay-Flat Enclosure allows you to quickly and easily add storage and transfer data to your computer or laptop from a SATA hard drive. It lays flat to take up little space and maintain stability. Just insert a 2.5-in. or 3.5-in. 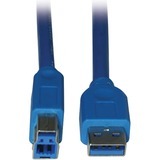 SATA HDD (Hard Disk Drive) or SSD (Solid State Drive) into the slot, and connect the included 4-foot USB 3.0 cable to the USB port on your computer. Slide the protective cover over the dock, even when it's in use, to keep the SATA drive dust-free at all times. 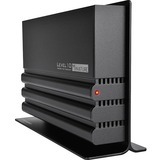 The docking station accepts SATA III (6 Gbps), SATA II (3 Gbps) and SATA I (1.5 Gbps) drives. 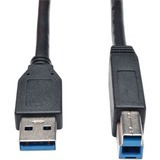 It supports USB 3.0 (5 Gbps), USB 2.0 (480 Mbps) and USB 1.1 (12 Mbps) transfer speeds, as well as UASP (USB Attached SCSI Protocol), which transfers data faster than conventional USB 3.0 and requires a UASP-enabled host controller. Plug-and-play configuration means it works right out of the box with no software or drivers to download or install. Green LED indicates the unit is connected to a USB port. Blue LED indicates the unit is receiving power. Works with Windows and Mac.